Dark Days, February 15. We had some apple cider from Patterson’s left (which is working on becoming hard cider…), and I’ve been meaning to try this, so last night I did. I think I’ve only braised things twice now, but it’s quickly becoming a favorite method of cooking. If you start everything early enough to account for a couple hours of cooking time, things work out great. For this dinner, I pulled out a pork shoulder roast from our hog, browned both sides for a couple minutes each in the Dutch oven, then simply poured in enough cider to just about cover it. Simmer over low heat for 2 1/2 to 3 hours, then remove and watch it fall apart on the plate. 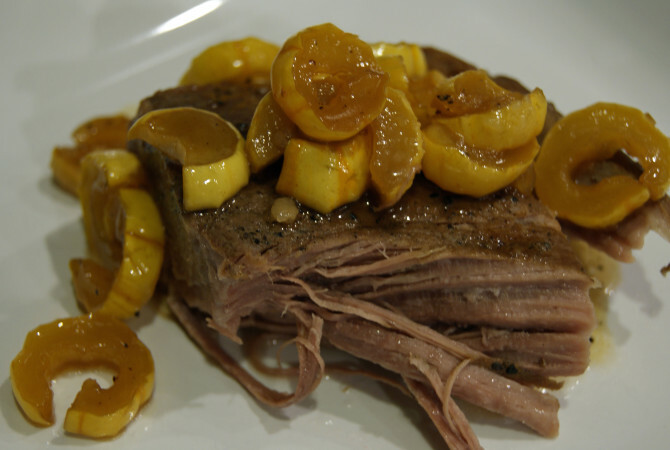 I served this with the last of the Delicata squash, which I sauteed in a maple syrup-apple cider reduction. Delectable. Very apple-y and gently sweet – the perfect flavor accompaniment for the luxuriously tender pork.